Yachtsman Steakhouse is a tidy little nondescript restaurant churning out some really incredible food. All light woods, white tablecloths, and windows, you really don’t know what to expect when you walk in; but do me a favor and order yourself a steak. The Cowboy Steak is just about my favorite cut of meat. It’s a ribeye that still has its bones, and it has incredible flavor all on its own. However, I always order it with some melted garlic butter on top, which makes it even better. Sadly, the Cowboy Steak isn’t on the menu at “press time,” but they change the steaks up quite regularly at Yachtsman Steakhouse, so think happy thoughts and maybe it’ll be there when you are. Ah, yes. How would I dare do a “best steaks” post without include this darling of the Disney set? Luckily, I’m right there on the bandwagon with everyone else who loves the Le Cellier Filet with Wild Mushroom Risotto and White Truffle-Herb Butter Sauce. The filet is always tender, and coupled with that superstar mushroom risotto it just can’t go wrong. Found in Disney’s Animal Kingdom Lodge, Jiko is a bit of a dark horse in the favorite steak category. But anyone who’s tasted it knows that their Oak-grilled Filet Mignon with Macaroni and Cheese and Red Wine Sauce is a force to be reckoned with. 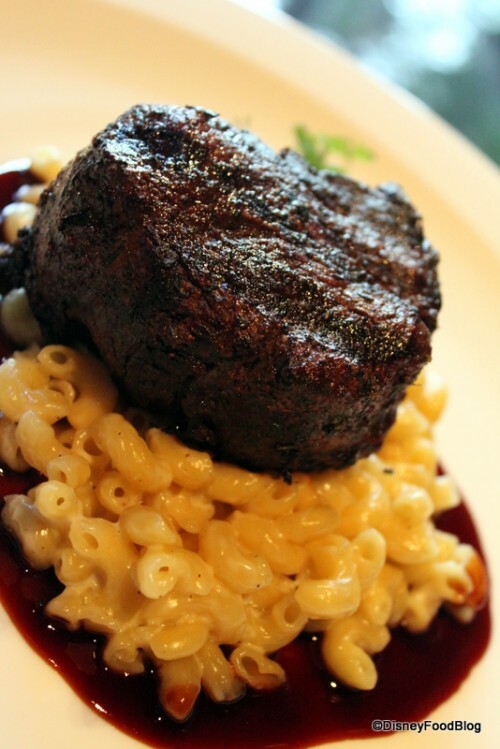 The macaroni and cheese adds a sharp taste while the red wine sauce adds a tangy accompaniment to the smooth Filet. It really is an orchestration of flavors that anyone can enjoy. I mean, just look at that picture! Don’t you want to dive in?!? What can I say — another cowboy (did you know I currently live in Texas?). Shula’s Steak House is a fascinating place for so many reasons — Don Shula himself, the 48-ounce eat-it-all-and-you-get-your-name-on-a-plaque steak, the menu on a football, and so much more. But today we’re just talking about steak, and the steak is luxurious. Shula raises his own cattle, and there is a bit of a “Dolphin Difference” at this place. The meat isn’t dressed in any special way, but the taste is out of this world. While there are several restaurants that I could slide into this final spot, Flying Fish Cafe wins the slot because it’s innovative and eager-to-please. It’s an incredible steak at a seafood place — pretty hard to come by, yet I’m always hearing recommendations about it! When I finally tried their signature Char-crusted Certified Black Angus New York Strip Steak with Roasted Fingerling Potatoes, Root Vegetables, and Pole Beans with Classic Sauce Foyot, I understood what all the shouting was about. It has a different taste to it than any other steak I’ve eaten in Disney restaurants. 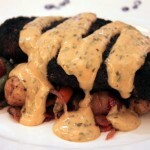 The char-crusting gives it a depth that might be a bit too much for some folks, but for a steak-lover like me makes it just unique enough to edge out other favorites. By the way, I didn’t know what Pole Beans were, either. Apparently they’re just beans that are grown on poles or trellises. See, I learn so much by writing this blog. I know that there are a lot of you meat-heads (ha ha) out there who have different ideas about the best steaks in Disney World, so let’s hear ’em! 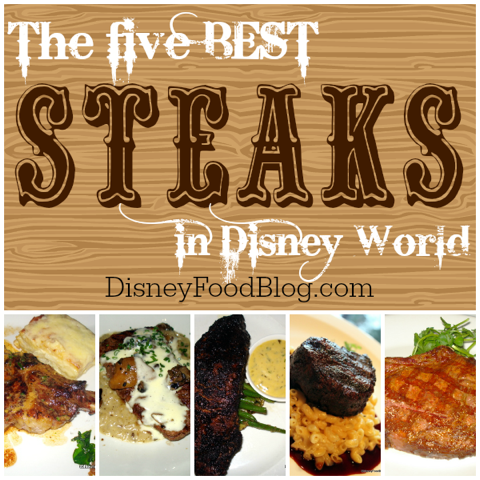 Like I said, I’m putting together a post about the most underrated steaks in Disney World, and I can always use suggestions! Best steak I ever had on property was at The Wave. A filet that was beyond tasty, tender and awesome. The friend I was dining with wanted to try a bite. NO. I know it’s not in DisneyWorld but it is at a Disney resort, Sonya’s at Disney’s Vero Beach Resort has an unbelievable oak-grilled beef tenderloin filet with truffle-infused mac and cheese in a red wine sauce, and petit herbs for $36. It was as good, if not better than the filet at Le Cellier. If anyone ever has a chance to visit the resort, I highly recommend it! I would have to agree with Sherri – we went to Yachtsman back in Sept. 5 people in our group had a good meal – not a great one – but a good one. 1 member of our group had a terrible steak. We will not go back. We will try Le Cellier for the first time this fall. Looking forward to it. I had the fillet at le cellar many years ago. It was great. A few years ago we tried to go back but when finding the higher prices, difficulty getting seated, and the new menu with truffels we decided to go else where. My son is very picky. Its a fillet or nothing when it comes to steak for him. There is an italian restaraunt in downtown. We had the fillet it was perfect. Flavoring was delicious and it just melted in my mouth. The captains galley also in the yacht club has great steak. Actually the galley and the yachtsman share a kitchen. The steak menu is obviously limited at the galley. But when its on the menu it is great. I know I don’t need the competition for reservations, but It’s the Fillet at the Wave. 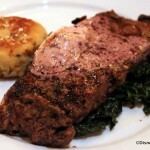 My pick for best Disney steak is at the California Grill in the Contemporary Resort. We always have the filet there and it is seasoned and cooked perfectly. We’ve never been disappointed. 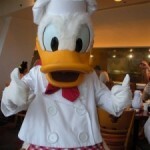 We will be at Disney in September and hope that Cali Grill is back open by then! Chefs of France filet is a close second. 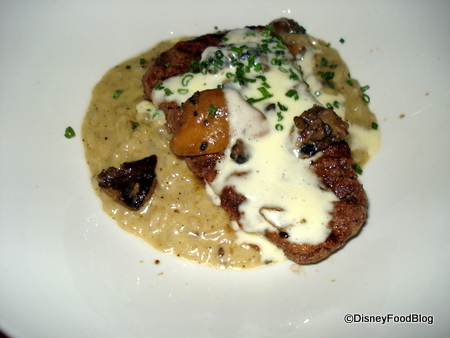 We have been disappointed with Le Cellier in the last few years. We were shocked by the flavors in the steak at Kouzzina by Cat Cora. I wish I had that rub recipe! It was amazing. I have to agree with those that said the filet at California Grille must be in this list. It is one of the very best in property. Grilled perfectly and the accompaniments are great. Just had the filet at Hollywood Brown Derby and have to say it was spectacular. The compound butter melted over the top made it melt in your mouth. I had a delicious steak at Mama Melrose inside HS. Heck that whole meal was the best part if our trip! I have to say I had an amazing steak at Mama Melroses, it was so good we went back and all five of us ordered it! My husband has to have steak almost every meal while we are at Disney. 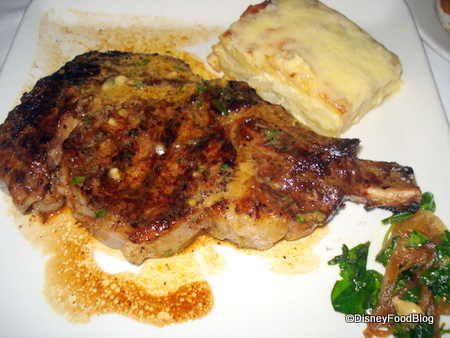 Le Cellier, California Grill are the obvious choices for the best steaks. However, we think the filet at Chefs of France is very good. My husband has had steak at Coral Reef, Tutto Italia, San Angel Inn, Tony’s Town Square Café, Be Our Guest, Yak & Yeti and Brown Derby. He’s never complained about a bad steak yet! Had the three: Brown Derby, Cali Grille, and Flying Fish. I agree that the unique preparation makes the FF the winner. My picks in order are Cali Grill, Le Cellier and Hollywood Brown Derby we used to like the Yachtsman but the service and quality was subpar last time we ate there. I am usually a fan of filet but the strip steak at flying fish was so unique and delicious, it gets my vote. I just got back from Disney and I will spending my time now trying to find the rub recipe from ffc. We just went in September and I have to say Fulton’s steak had my mouth watering! I can’t wait to try Cellier! I managed to grab a table at Queen Victoria’s Room in Victoria & Alberts Restaurant whilst we were there on Honeymoon in October. Without question, the nicest beef steak I experienced at Disney, or infact, ever. Yes, there is the very obvious price tag associated to dining at Victoria & Alberts, but it was worth every penny (and more). We paid for the upgrade on the steak dish, to experience both the Kobe and the Wagyu Steaks. The taste was like nothing I had every experienced before from a steak, it was as if the beef was actually melting as I tasted it. I’m a big 6ft 5 fella, and I was sitting there with my eyes getting weepy as I was savouring every moment of their delicious dish. Le Cellier was very good, as was California Grill and Jiko. However, I’m certain you will not find a higher grade or nicer steak than at Victoria & Alberts. 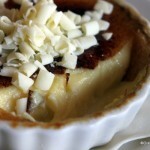 The Jiko filet with Mac andchesse is AMAZING! Jiko is my favorite Disney World restaurant u far. I always order the steak from mama melrose. It is my favorite restaurant in Disney world and would highly recommend it! 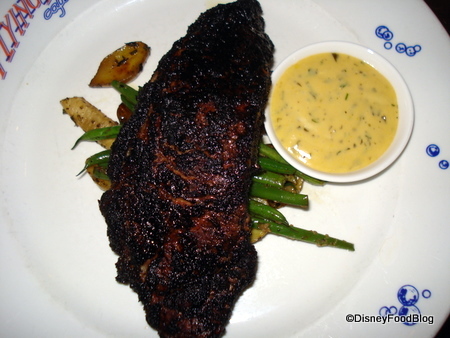 Our favorite filet’s are served at Brown Derby and California Grill. The view at CG is an added benefit. Both restaurants have delicious, cut it with a fork, tender steaks. 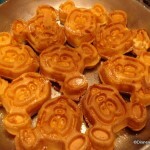 We highly recommend these Disney restaurants.